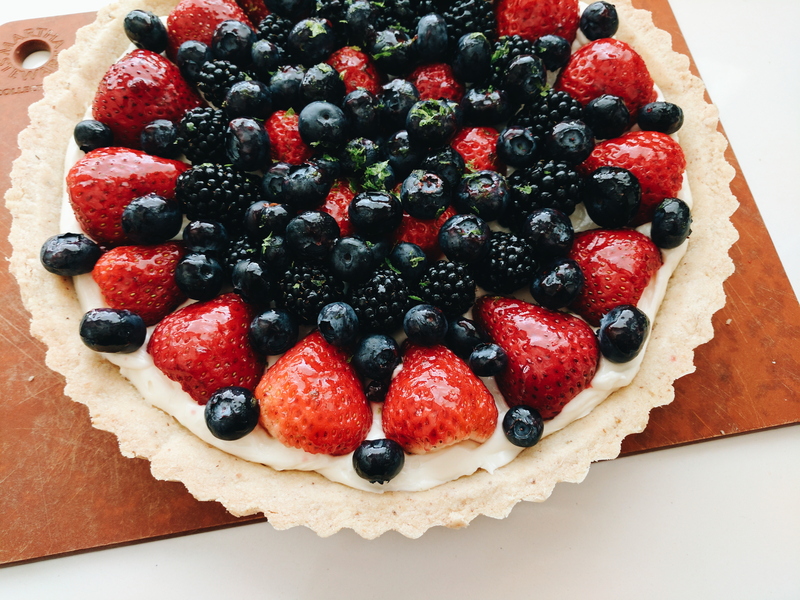 I like to make a fresh fruit tart at least once a year, but no more than once a year. This dessert is extremely fatty and carb-y, but everything is fine in moderation! To make the tart crust, I processed walnuts into a fine consistency. Then, I processed 1/2 cup of the walnut meal with 1 cup of flour, 1/2 cup of powdered sugar, and 1 1/2 sticks of softened butter. I pressed the dough into a tart pan with a removable bottom, and bake for about 18 minutes. The crust expands, so I always press it back down to shape while it’s still hot. To make the filling, I beat together 8 ounces of softened cream cheese (use Neufchâtel for less fat, but also less flavor), lime zest, a big squeeze of lime juice, a splash of vanilla extract, and about 1/3 cup of granulated sugar. 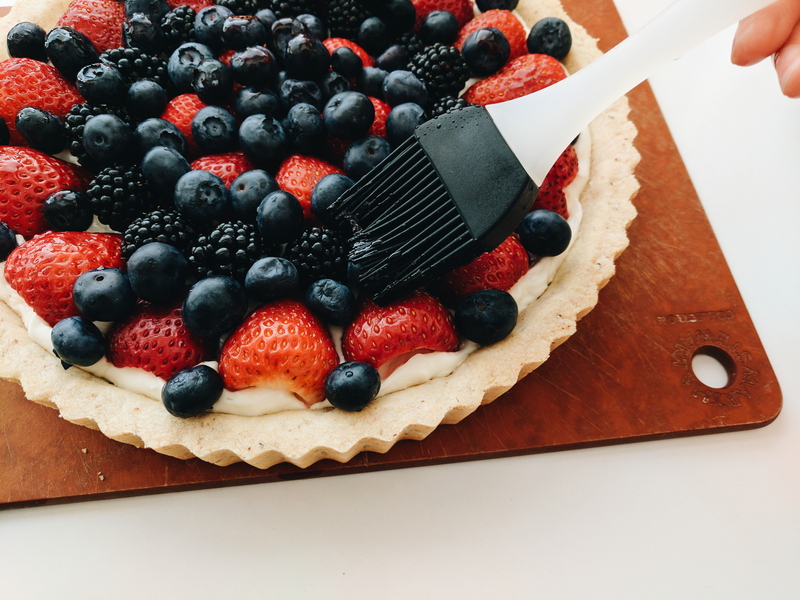 When the tart crust was cool, I slathered on the filling and topped it off with berries (or any other in-season fruit). I glazed the fruit with melted preserves/jam/jelly. 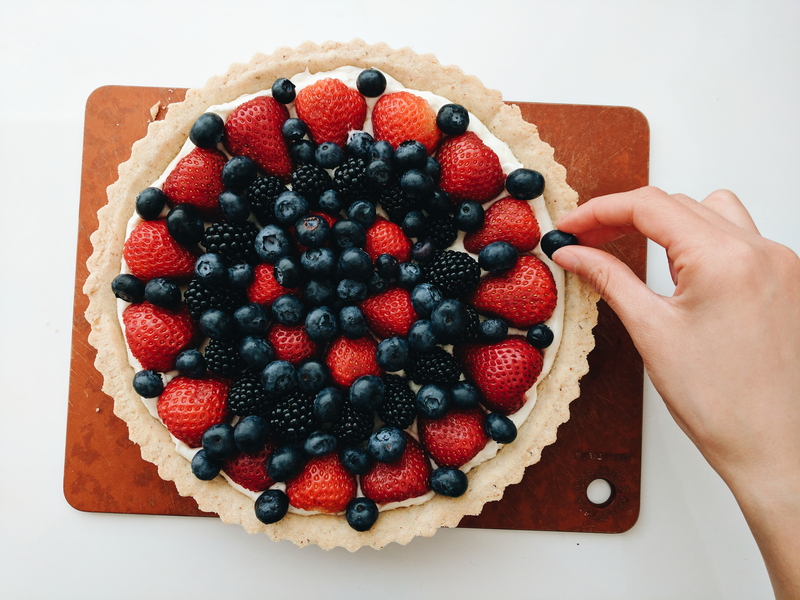 If you’ve ever seen a bakery fruit tart, you’ve probably noticed how shiny the fruit looks. Never skip the glaze!